This is a set of 26 sheets, each sheet containing a capital and a small letter of the alphabet as well as a short, simple, silly rhyme full of words stating with that letter. Each little alphabetical rhyme can be sung to the melody of “Twinkle, Twinkle Little Star.” One Arts Infusion Collaborative seeks to create products that combine content and music as each one informs and enhances the other. 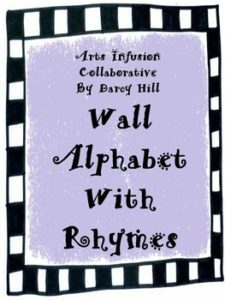 Wall Alphabet and ABC Rhymes by Darcy Hill is licensed under a Creative Commons Attribution-NonCommercial-NoDerivatives 4.0 International License.